In the early ‘70s Ringo was wondering what he was going to do with the rest of his life. He drummed on Lennon and Harrison’s albums, but that wasn’t enough. He started a furniture company and designed things like donut-shaped fireplaces and flower-shaped tables with petal seats. But mainly, he wanted to be an actor. Lennon was the first Beatle to try his hand at acting in a movie apart from the others (in How I Won the War, which I still have not been able to bring myself to sit through). But in 1968, after briefly quitting during The White Album sessions, Ringo started his own career. He could’ve used an astute manager to help him select projects, however. Most of Starr’s films stand as cautionary artifacts of late ‘60s drug-addled indulgence. There were two disappointing Terry Southern adaptations – Candy (1968) and The Magic Christian (1969) with Peter Sellers — Frank Zappa’s 200 Motels (1971), an Italian spaghetti Western Blindman (1971), and probably the best of them, Harry Nilsson’s animated TV special The Point! (1971). In 1972, Starr directed a rockumentary about his good friend Marc Bolan of T. Rex called Born to Boogie. The film that could have been a turning point was That’ll Be the Day (1973), which captured the nostalgia craze in Britain like American Graffiti did here in the States, though it didn’t make much of a splash on American shores. Written by journalist Ray Connolly, it was inspired partly by the story of John Lennon’s rise. Another influence was Harry Nilsson’s autobiographical song “1941,” about a father abandoning his son, which was one of the first things that drew Lennon to Nilsson, as it mirrored the story of his own childhood. The movie took place in the late 1950s and featured singer David Essex (“Rock On”) as a young man working at a summer resort. The streetwise Starr takes him under his wing, and eventually Essex’s character becomes a rock star. Starr’s role was supporting but large. He played a Teddy boy, English cousins to American greasers, who wore velvet-collared jackets instead of the leather variety. Starr had been in teddy boy gangs in his youth as a drop out, forced to participate in gang rumbles before finding a way out through music. Starr brought the same naturalistic, low-key charm to the role he had brought to A Hard Day’s Night. After the flops of his first two genre albums, Starr focussed on films and finally made an undeniably good movie. Had he continued performing in well-written indie films, he could’ve really made it as an actor. But just then, his record career kicked back in with the smash solo album Ringo, produced by Ringo’s best pal Nilsson’s producer Richard Perry. A sequel was made to That’ll Be the Day called Stardust, in which Essex’ and Starr’s characters go through the decadent, psychedelic sixties. Perhaps because he was enjoying a streak of hit singles, Starr demurred and let buddy Keith Moon replace him in the role. Starr and Nilsson attempted to do their own horror spoof called Son of Dracula (1974) but it was reportedly so bad Starr could subsequently not bear to look at it. He also appeared as the Pope in Ken Russell’s follow up to Tommy, Lisztomania (1975), with Roger Daltrey as classical composer Franz Liszt. But after That’ll be The Day, Starr’s most notable film was, alas, 1981’s goofy comedy Caveman. He also appeared in McCartney’s meandering Give My Regards to Broad Street, which offered to pleasure of seeing half the Beatles hanging together and playing good music, but little by way of story. After a string of albums throughout the ‘70s and early ‘80s, Starr’s declining sales brought his recording career to a halt. Starr’s Old Wave (1983), produced by ex-Eagle Joe Walsh, contained some great tunes, but no label was interested in putting the record out in the U.S. or U.K. It would be his last album for nine years. For the rest of the decade he only appeared in the aforementioned Broad Street, Little Steven’s Artists United Against Apartheid’s “Sun City” (with his son Zak Starkey), and a Grammy-nominated cover of “Act Naturally” with Buck Owens. Giving up on finding a new record label, in 1984 he took the Thomas the Tank Engine and Friends narration gig. Based on a series of children’s books, the TV show became a success in the U.K. and then around the world. Starr narrated two seasons, and when it spun off an American PBS series called Shining Time Station he played Mr. Conductor, for which he was nominated for a Daytime Emmy in 1989. “John had the intellectuals; Paul had the teenies and George the mystics; I always got the mothers and babies,” he quipped. It was nice timing in that he was the first Beatle to become a grandfather, when Zak had a daughter named Tatia Jayne Starkey in 1985. In 1989 he would form the Ringo Starr All-Star Band, resume touring, and go on to make some of his finest albums. Still, one wonders what he could have done had he taken on more roles like That’ll Be the Day. 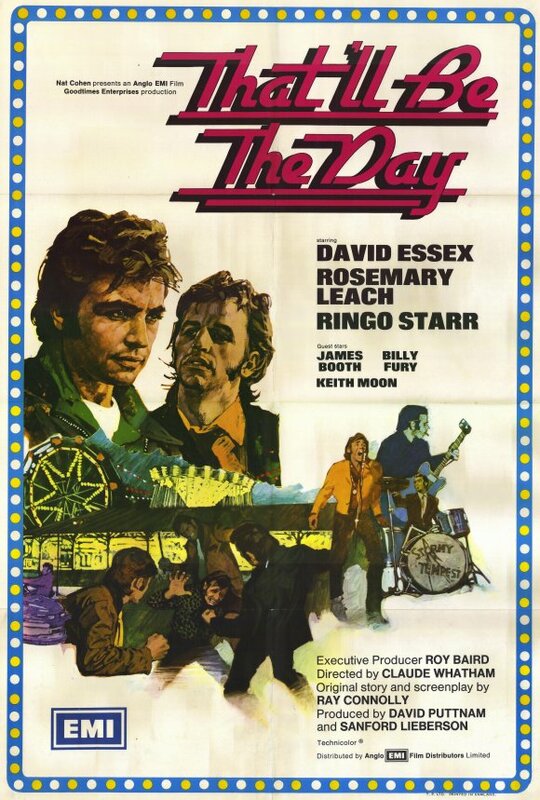 Nice report… Though notice you say Keith Moon took on Ringo’s “That’ll be the day” role in the sequel “Stardust”. Moon was in both films playing the same character. Adam Faith played Ringo’s role becoming manager to Essex’s character. Thanks — I’ll have to get my hands on some copies and refresh my memory! !